You will need: 23cm springform tin, oiled and the sides lined with baking parchment. 1. Heat the oven to 150ºC / 130ºC fan / 300F / gas 2. Melt the butter in a saucepan over a low heat. Mix with the crushed biscuits, press into the base of the tin and chill. 2. Beat the cream cheese, eggs, sugar, orange zest, orange essence and salt until smooth. Pour over the base then cook in the oven for 55 minutes or until there's a slight wobble but it's firm at the edges. Remove and carefully run a knife around the edge to prevent cracking. Return to the switched-off oven to cool, then refrigerate overnight. 3. To make the topping, mix the cornflour with 2tbsp water, pour into the pan with the cranberries and sugar. Heat gently for 10 minutes until the fruit has softened. Set aside to cool. 4. 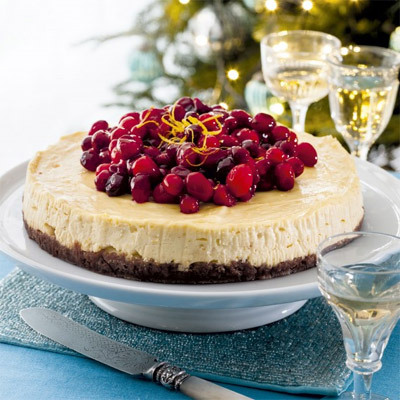 To serve, pile the cranberries on top of the cheesecake.